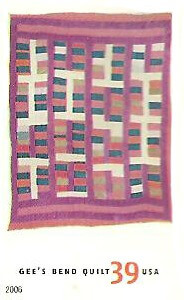 Enslaved women in the rural, isolated community of Gee’s Bend, Alabama began quilting in the 1800s. Their quilts were necessary and practical to provide for warmth for their families rather than a quest to reinvent an art form. 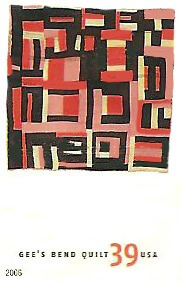 Unexpectedly, by piecing together scraps of fabric and clothing, they were created abstract designs inspired by their culture, experiences, and artistry, that had never before been expressed on quilts. Gee's Bend, Alabama is a tiny rural community located in a large bend of the Alabama River in Wilcox County, that, because of its geographic isolation from surrounding communities, has been largely left to itself for over 100 years since the end of the Civil War. It comes as no surprise therefore, that many of its traditions, including quilting, remained virtually unchanged into the 21st century. Passed down generation after generation, these patterns and piecing styles from the early 19th century survived slavery, the antebellum South, and Jim Crow. During the Civil Rights movement in 1966, the Freedom Quilting Bee was established as a way for African-American women from Gee’s Bend and nearby Rehoboth to gain economic independence. The Quilts of Gee's Bend: A Slideshow at the National Endowment for the Arts provides images of some beautiful award-winning quilts and quilters, Mary Lee Bendolph, Lucy Mingo, and Loretta Pettway. 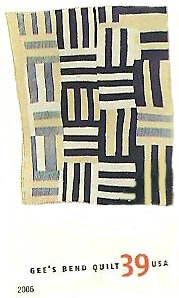 These quilting traditions are shared by Black quilters in many rural Alabama, Georgia, and Mississippi communities, which have come to be synonymous with the Gees Bend quilts. 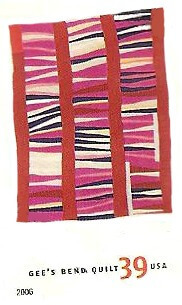 Quilts made in this tradition tend to share certain features such as: bold vertical strips, bright colors, large designs, multiple patterns, symbolism, asymmetry, and improvisation. 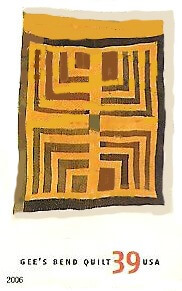 When studying the features in the quilts of this particular African American quilting tradition, most notably the Gees Bend quilts, many scholars have suggested a linkage to the African textile design traditions. 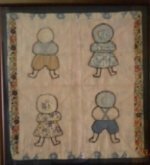 The Quilts of Gee's Bend in Context Project at Auburn University explores the history of Gee's Bend, Alabama, and tries to show it in the context of the lives, traditions, and histories of its residents and the Gees Bend quilt tradition. There are quilters and then there are the amazing women who sew quilts in Gee’s Bend, Alabama. 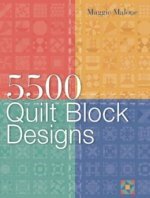 While all of these features have been utilized in some fashion in quilts made all over America, the tradition of the women in these communities has combined the features in a distinctly unique way. Intensely personal and inventive, the quilts are also of a time, place, gender and ethnic group, adapted according to the artist's own interests and history. 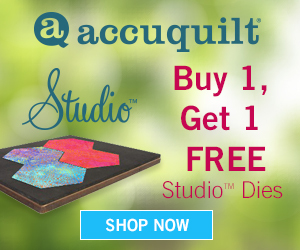 Some of the commonly used quilt patterns used by these quilters, include the star, housetop, log cabin, the bar design, and the sampler or everybody quilt. 86 ½ x 73 ½ inches. Collection of the Tinwood Alliance. Geraldine Westbrook (American, b. 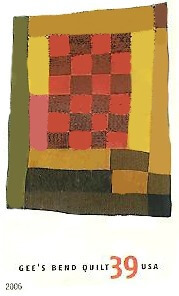 1919), "Housetop"-sixteen block variation, 1982. Mary Lee Bendolph (American, born 1935), Blocks, strips, strings, and half squares, 2005. 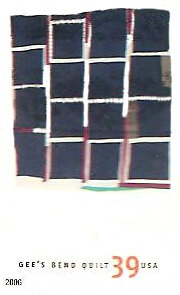 Cotton, 84 x 81 inches. In August, 2006, the U.S. Postal Service celebrated the rich quilting legacy of four generations of African-American women in rural Alabama by issuing the "American Treasures: Gees Bend Quilts" commemorative stamps. The stamps on this bear images of Gee's Bend quilts sewn between c.1940 and 2001.